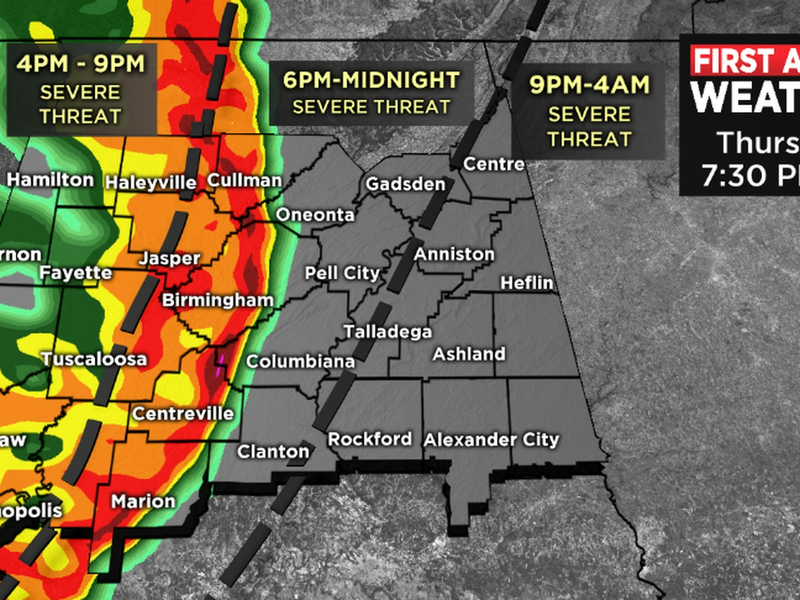 BIRMINGHAM, AL (WBRC) - We’re still seeing another threat for strong to severe thunderstorms that will impact our area starting around 4 p.m Thursday and continuing through 3 a.m on Friday. 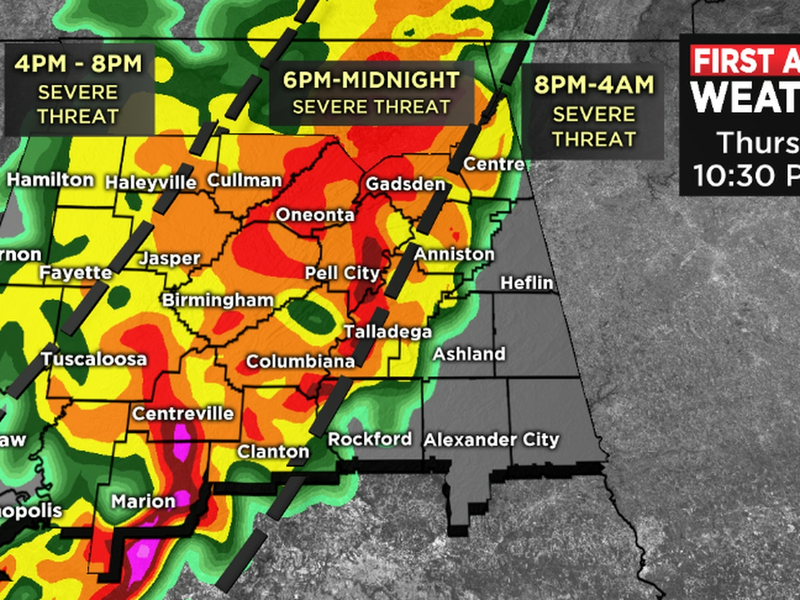 All modes of severe weather will be possible, including destructive straight-line winds, hail, and isolated tornadoes. Our biggest concern for tornadoes will be over areas west of I-65 early on and then again over southeast areas later at night. That said, an isolated tornado, and especially damaging winds, can’t be ruled out in any county within our coverage area. Forecast data suggests a squall-line will impact the area from west to east during the evening and the severe storms should exit our eastern counties by 3 a.m. on Friday. 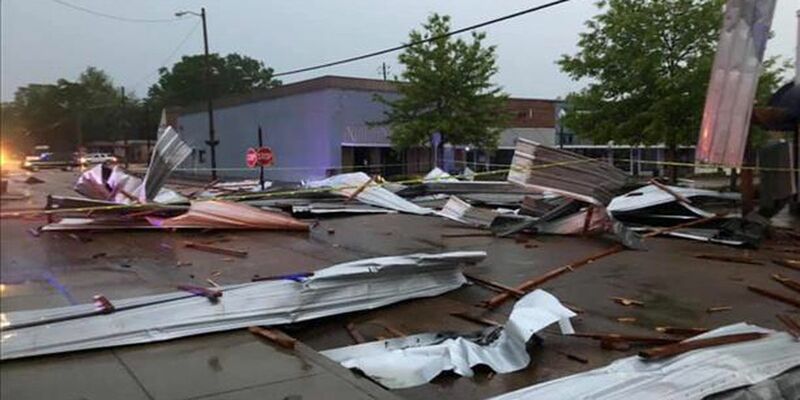 Stay weather alert and have multiple ways of receiving severe weather updates, including our FREE WBRC First Alert Weather app. BACK TO JACKET WEATHER ON FRIDAY WITH MORE RAIN: We will start off with a break in the wet weather on Friday however rain will be returning in the afternoon. A deep upper level trough will swing over the state and bring another increase in clouds, with showers likely for Friday night and into the day on Saturday. This will make for a colder and dreary setup to start the weekend. In fact, plan on temperatures tumbling into the 50s on Friday, with a cold west-northwest wind. If you have plans for Saturday morning, I cannot rule out wet weather, with temperatures in the cold 40s. The rain will shift into eastern areas throughout the day on Saturday, with some clearing Saturday night. This will make for a cold start on Easter morning, with lows in the 40s. Sunrise time will be at 6:10 a.m. We will enjoy a good supply of sunshine on Easter Sunday, with highs in the middle 70s. WHAT TO EXPECT NEXT WEEK: Dry weather will be the story for a good portion of next week, with high temperatures making a quick rebound into the 80s for Monday and Tuesday. The next rain maker will impact the state next Friday, with a chance of scattered storms and showers returning. Right now this system doesn’t look quite as severe as the one set to roll in tomorrow. We will keep an eye on it and let you know if anything changes.